We have three teams working on the kindergarten. The carpenters, Devi Lal and Babu, who are are in charge. 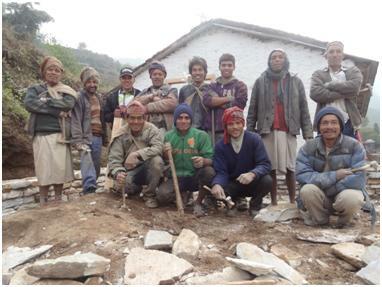 The stone breaking team of young guys working at the river below in the valley who are led by Shiva, the Maoist. Lastly the stonemasons (pictured here) who hammer and chip the stone into usable shaped ‘bricks’, and do the actual building. 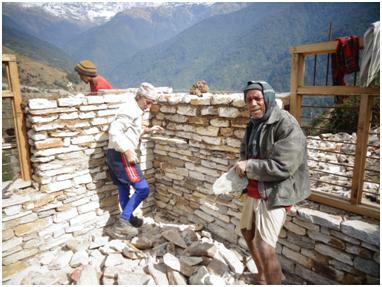 The stonemasons are all from Kalimati village, plus a couple to help speed up work from Ghalel. They are the fathers, grandfathers and uncles of the children at the school. Some are on the School Management Committee – all in all a great bunch of guys to work with. Although only Devi Lal and the school teachers speak English, we still have good conversations. They tease me incessantly about Health and Safety onsite as they balance precariously on bamboo scaffolding they have constructed as the walls grow higher. We could build a lot faster by using factory made concrete blocks, but I am told the stone is stronger, will last longer and is the traditional method of building around here. In addition they can and will be reused if the school building is moved, rebuilt or torn down in the future. The walls are dry stacked with moist earthen mud dug from a hole directly next to the building site, it seals and pack the wall securely. Cement is only used for the foundations and final layer to provide the internal walls with a smooth paintable finish. So all going swimmingly or so I thought… I arrive on site today to find the the tractor we have been borrowing from Sudip to transfer the stone from the river to the school has departed for a week. No stone deliveries, therefore no building after the stone runs out. We are definitely on Nepali time and whist I am keeping an eye on the calendar as the days tick closer to my flight home, there is little to choice but to go with the flow. Last week we stopped work to celebrate the goddess of education, this week no tractor, next week there will be yet another holiday, this time because the headmaster’s parents are both turning 84, a significant birthday in Nepal, to which the entire village will take the day off to celebrate. Any other milestone birthday is ignored – 75 irrelevant, 85 not a blink of an eyelash, 100 who cares? It is important in Nepal not to die between the ages of 80 and 84 – before is fine and after 84 you get to go to paradise – but woe betide those who die in the 4 preceding years. I have asked but no-one can tell me why. Or perhaps I have entirely misunderstood… not an unusual occurrence!